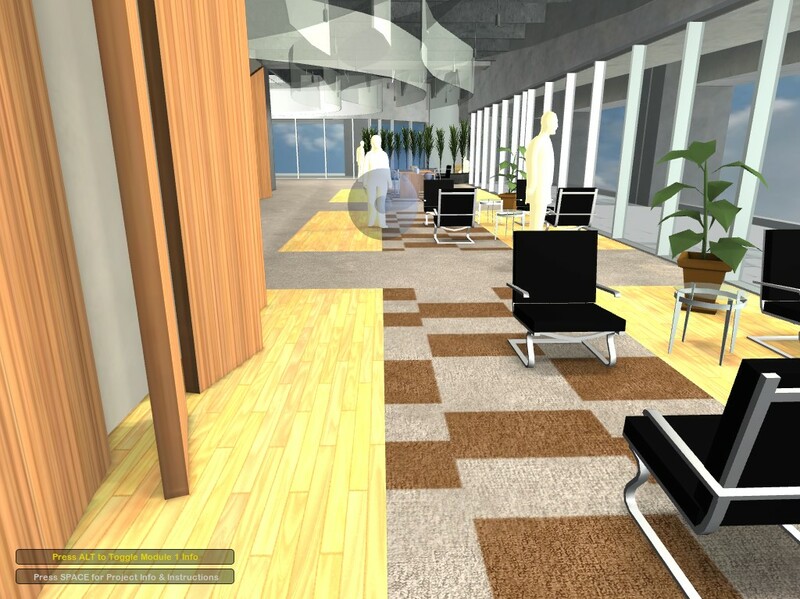 A 2008 research focusing on the design of virtual interactive tour of a Wachovia/Wake-Forest Intelligent Sustainable Space in downtown Charlotte, North Carolina. The primary purpose of the tour was to allow stakeholders to experience immersive interactive multimedia art installations integrated into the space and designed to promote notions of sustainability and collaboration. The project was in part sponsored by grants from Wake-Forest, Virginia Tech Institute for Society, Culture, and Environment (ISCE) and the Institute for Critical Technology and Applied Science (ICTAS). Use of Unity3D and MaxMSP rapid prototyping tools for the purpose of creating an immersive conceptual visualization of the final space and its three interactive modules. Bukvic, I., S. Betz. (2011). “USING GAMING ENGINE FOR VIRTUAL PROTOTYPING AND IMPACT ASSESSMENT OF COMPLEX INTERACTIVE ART INSTALLATIONS.” International Computer Music Conference, Huddersfield, United Kingdom.